Guangzhou is the capital and the sub-provincial city of Guangdong Province in the southern part of the People's Republic of China. The city is also known by an older English-language name, Canton. It is a port on the Pearl River, navigable to the South China Sea, and is located about 120 km (75 miles) northwest of Hong Kong. As of the 2000 census, the city has a population of 6 million, and a metropolitan population of roughly 8.5 million (though some estimates are as high as 12.6 million) making it the most populous city in the province and the third most populous metropolitan area in mainland China. The site of Guangzhou has been continuously occupied since Panyu (蕃禺, later simplified to 番禺) was founded there in 214 B.C.E. Panyu became the capital of the Nanyue Kingdom (南越) in 206 B.C.E. The recent discovery of the remains of a Qin dynasty shipyard under the archeological site of the Nanyue Kingdom Palace, suggests that the city might have traded frequently with foreigners by the sea routes. Foreign trade continued through every following dynasty, and the city remains a major international trading port to this day. By 1800, foreign trade had made Guangzhou the third most populous city in the world, with 800,000 residents. The Chinese abbreviation of Guangzhou is Sui (穗; pinyin: sùi; Jyutping: seoi6; Yale: seuīh) or sometimes GZ. The city has the nicknames of Wuyangcheng (City of Five Rams), Yangcheng (City of Rams), Huacheng (City of Flowers), or Suicheng (City of Wheat). The city can also be referred to as the MuMianCheng (City of Ceiba). "Canton" was the convenient Portuguese or French romanization of "Guangdong" Province. The city Guangzhou is the capital of the province and frequently referred as 廣東省城 ("the Canton Province Capital City") or simply 省城 ("the Province City") by Cantonese people. The city naturally represents the province and thus the name of the province was used as the city's name. It may have been more convenient for Europeans, who during the colonial period generally did not understand spoken Chinese nor the written logo graphic characters (see exonym and endonym). Guangzhou is the pinyin Romanization of the Mandarin name for the city. Guangzhou is located at 112°57'E to 114°3'E and 22°26'N to 23°56'N. The city is part of the Pearl River Delta. 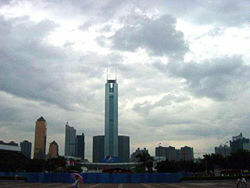 Guangzhou is a sub-provincial city. It has direct jurisdiction over ten districts and two county-level cities. As of April 28, 2005, the districts of Dongshan and Fangcun were abolished and merged into Yuexiu and Liwan respectively; at the same time the district of Nansha was established out of parts of Panyu, and the district of Luogang was established out of parts of Baiyun, Tianhe, Huangpu, and Zengcheng. 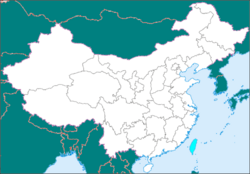 The Han Dynasty annexed Nanyue in 111 B.C.E., and Panyu became a provincial capital. In 226 C.E., the city became the seat of the Guang Prefecture (廣州; Guangzhou), and the Chinese name of Guangzhou replaced Panyu as the name of the walled city. Panyu remained the name of the area surrounding the walled city until the end of Qing era. According to a local Guangzhou government report, Arab and Persian pirates sacked Guangzhou (known to them as Sin-Kalan) on October 30, 758, which corresponded to the day of Guisi (癸巳) of the ninth lunar month in the first year of the Qianyuan era of Emperor Suzong of the Tang Dynasty. During the Northern Song Dynasty, a celebrated poet called Su Shi visited Guangzhou's Baozhuangyan Temple and wrote the inscription "Liu Rong" (Six Banyan Trees) because of the six banyan trees he saw there. It has since been called the Temple of the Six Banyan Trees. The Portuguese were the first Europeans to arrive to the city by sea, establishing a monopoly on the external trade out of its harbor by 1511. 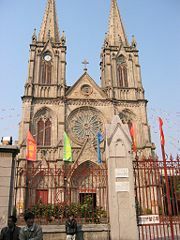 They were later expelled from their settlements in Guangzhou (in Portuguese Canton or Cantao), and instead granted use of Macau (first occupied in 1511) as a trade base with the city in 1557. The Portuguese dominated foreign trade in the region until the arrival of the Dutch in the early seventeenth century. After China brought Taiwan under its control in 1683, the Qing government became open to encouraging foreign trade. Guangzhou quickly emerged as one of the most adaptable ports for negotiating commerce, and before long, many foreign ships were going there to procure cargos. 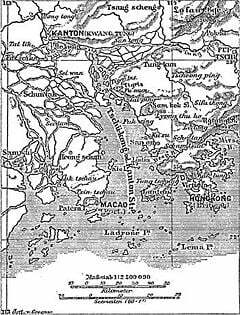 Portuguese in Macau, Spanish in Manila, and Armenians and Muslims from India were already actively trading in the port by the 1690s, when the French and English British East India Company's ships began frequenting the port through the Canton System. Other companies were soon to follow: the Ostend General India company in 1717; Dutch East India Company in 1729; the first Danish ship in 1731, which was followed by a Danish Asiatic Company ship in 1734; the Swedish East India Company in 1732; followed by an occasional Prussian and Trieste Company ship; the Americans in 1784; and the first ships from Australia in 1788. By the middle of the eighteenth century, Guangzhou had emerged as one of the world's great trading ports under the Thirteen Factories, which was a distinction it maintained until the outbreak of the Opium Wars in 1839 and the opening of other ports in China in 1842. The privilege during this period made Guangzhou the third most populous city in the world, with 800,000 residents in 1800. Guangzhou was one of the five Chinese treaty ports opened by the Treaty of Nanking (signed in 1842) at the end of the First Opium War between Britain and China. The other ports were Fuzhou, Xiamen, Ningbo, and Shanghai. 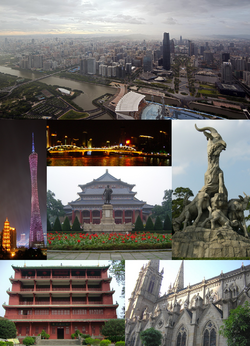 In 1918, "Guangzhou" became the official name of the city, when an urban council was established there. Panyu became the name of a county' south of Guangzhou. In both 1930 and 1953, Guangzhou was promoted to the status of a Municipality, but each promotion was cancelled within the year. Japanese troops occupied Guangzhou from October 10, 1938 until September 16, 1945. Communist forces entered the city on October 14, 1949. Urban renewal projects, including new housing on the shores of the Pearl River for the poor boat people, improved the lives of many residents. Economic and trade reforms instituted under Deng Xiaoping, who came to power in the late 1970s, led to rapid economic growth, due to the city's close proximity to Hong Kong and access to the Pearl River. As labor costs increased in Hong Kong, manufacturers opened new plants in the cities of Guangdong, including Guangzhou. As the largest city in one of China's wealthiest provinces, Guangzhou attracts farmers from the countryside looking for factory work. Cantonese business connections with Chinese overseas and beneficial tax reforms during the 1990s have aided the city's rapid growth. Guangzhou is the economic center of the Pearl River Delta and is the heart of one of mainland China's leading commercial and manufacturing regions. In 2006, the GDP exceeded ¥600 billion (USD 76.8 billion), about ¥85,000 (about US $11,000) per capita, ranking first among the other 659 Chinese cities. Inaugurated in the spring of 1957, the Chinese Export Commodities Fair, also called "Canton Fair," is held each spring and autumn by Bo Liu, and is a major event for the city. The Guangzhou Metro station at Sun Yat-Sen University is among several stations that serve the city. When the Guangzhou Metro opened in 1999, Guangzhou became the fourth city in China to build an underground railway system. Currently four lines are operational, and there is an ambitious plan to expand rapidly, with three lines already under construction and four more planned for the future. Guangzhou's main airport, New Baiyun International Airport in Huadu District, opened on August 5, 2004, replacing old Baiyun International Airport close to the city center. Guangzhou is connected to Hong Kong by train, bus and ferry services. Express trains depart to Hong Kong from the Guangzhou East railway station and arrive in Hong Kong at the Hung Hom KCR station. They cover the 182 km route in approximately two hours. Daily ferry sailings include an overnight steamer, which takes eight hours, and high-speed catamarans and hydrofoils which take three hours to reach the China Ferry Terminal or Macau Ferry Pier in Hong Kong. The new Nansha Pier (新南沙客运港) is now open with six lines traveling daily between Hong Kong and Guangzhou. The trip takes seventy-five minutes (¥116-230). Starting on Monday, January 1, 2007, the city government banned motorcycles from the urban area, and the Guangzhou traffic bureau has reported reduced traffic problems and accidents since the motorcycle ban in downtown area..
Guangzhou will hold the 16th Asian Games in November 2010. The city will have to spend about 220 billion yuan (US$26.5 billion) in the run-up to the 2010 event to improve infrastructure, build an athletes' village and a new railway station, as well as complete the second phase of the new Baiyun International Airport. Plans are also underway to build what will become the world's tallest free-standing Guangzhou TV & Sightseeing Tower for the 2010 Asian Games, 610 meters tall. Guangdong and the greater metropolitan area is served by several Guangdong Radio stations and Guangdong TV. There is an international station Radio Guangdong which broadcasts information about this region to the entire world through the World Radio Network. ↑ 土地面积、人口密度（2008年）. Statistics Bureau of Guangzhou. Retrieved February 8, 2010. ↑ 广州市2010年第六次全国人口普查主要数据公报 (in Chinese). Statistics Bureau of Guangzhou (2011-05-16). Retrieved May 25, 2011. ↑ 2010年广州市国民经济和社会发展统计公报 (in Chinese). Statistics Bureau of Guangzhou (2011-04-07). Retrieved May 25, 2011. ↑ Nanyue Kingdom Palace Museum, Guangzhou International. Retrieved October 20, 2007. ↑ Sima Guang. Zizhi Tongjian. (in Chinese) Retrieved October 20, 2007. ↑ Top 10 Cities of the Year 1800, About, Inc. Retrieved October 20, 2007. ↑ Life of Guangzhou - Traffic Jam Improve after Motorcycle Ban, Guangzhou Interactive Information Network Company. Retrieved October 20, 2007. ↑ Date set for LPG-fueled buses, taxis, China Daily. Retrieved October 20, 2007. "International Business - CHINA: MEDIA - The Guangzhou Daily, Which Models Itself on the Western Press, Faces Lots of New Competition." Business Week. 23. 2003. Le Bas, Tom, and Brian Bell. Hong Kong, Macau & Guangzhou. Insight guides. Hong Kong: APA Publications, 2005. Needham, Joseph. Science & Civilisation in China. Cambridge University Press, 1954. Satellite photo of the city. Guangzhou TV & Sightseeing Tower. This page was last modified on 18 July 2017, at 15:01.